Christian Writer/Reader Connection: Happy Blogoversary! Yup! 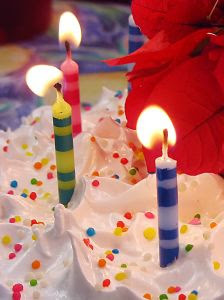 This month is Christian Writer/Reader Connection's 1st Blogoversary. To celebrate and thank all of my blogging friends, we're having our biggest and best giveaways ever. On Wednesday, May 6, 2009, Julie Lessman joins us for a fabulous interview and book giveaway. Let's get the ball rolling right now. The first contest book is, "Presumed Guilty," a legal thriller by James Scott Bell. Dallas Hamilton faces the greatest challenge of her life. This book keeps the tension going right to its stunning conclusion. To enter, leave a comment along with your email address using the format susanjreinhardt (at) gmail (dot) (com). The giveaway is limited to the Continental U.S. and Canada. A winner will be drawn by Mom on Sunday, May 10, 2009. I'll notify you via email and announce the winner on the blog. Woohoo! You know I'm entering. :-) Congrats on having your blog so long! Here's to many more blogoversaries. This is an exciting month. I'm grateful for all my faithful readers and commenters. Happy Blogoversary! That's a fun accomplishment. I'd love to enter to win the book. Thanks! Thanks, I'm having fun and hoping to make it special for all of you. I have your email and Jessica's, but need everyone else to leave their info in the comment section. Congrats on one year!! I'm entering. Please enter my name. You have my email. Dear Susan's Mom: I love you dearly! Oh, thank you! I love music. I'll be sure to pass your message on to Mom. Thanks for entering the drawing. Watch for more drawings this month. Thank you, thank you! You're very kind. I'm looking forward to giving away this book and others throughout the month. Happy Blogorversary to you. I am very happy for you. Please enter me in the contest. Thanks! Consider yourself entered in the drawing. Happy Blogoversary! You have come a long way and the Lord has brought you forward for His glory and the furtherance of His Kingdom. May the Lord continue to help you in your endeavors and as He never forsakes His own. How nice to hear from an old friend! Thank you for your sweet comment. To God be the glory. I've entered your name in the drawing. I do enjoy your blog posts!!! Did you want to enter the drawing for "Presumed Guilty?" You've done such a good job here, Susan! I'm proud of you. Thank you for your kind words, but the credit goes to those who have patiently taught me the ropes and to the Lord who provides inspiration. I appreciate your support and prayers. Thanks for entering the contest - except this is an old one. I'll enter you in the latest.